Twitter is very popular social sharing site. I will say it is one of the easiest & simplest way to communicate with all over world. It is like SMS service of internet communities. On july 15, 2015 Twitter officially launched new dashboard look of Twitter accounts. They stated in their announcement that Twitter is concerned about privacy & safety of users since early time. They allow not to keep real name on twitter handles and provides options to set privacy settings on account. Beside messaging service twitter is also popular for connecting third party apps and services. These services are authorized to access our twitter data as we have given them permission at some time. It also cause us security threat to our twitter account. You no longer need to worry about it. Twitter has launched new dashboard with features where it will show all login attempts and third party apps access of our twitter account data. You can access Twitter dashboard data from twitter.com>> settings >> at left hand side menu options you will see ‘Your Twitter Data’ menu. On very top you will see information like account creation date, email, phone number and devices activated to browse twitter. On my profile it shows two devices first is my iPhone and second is my iPad device. For iPhone device it is showing mobile number and for iPad device it is showing some codes to identify the device. As shown in above screenshot you can clearly see which apps and services are using your account data. It showing their country location and timing of accessing data. 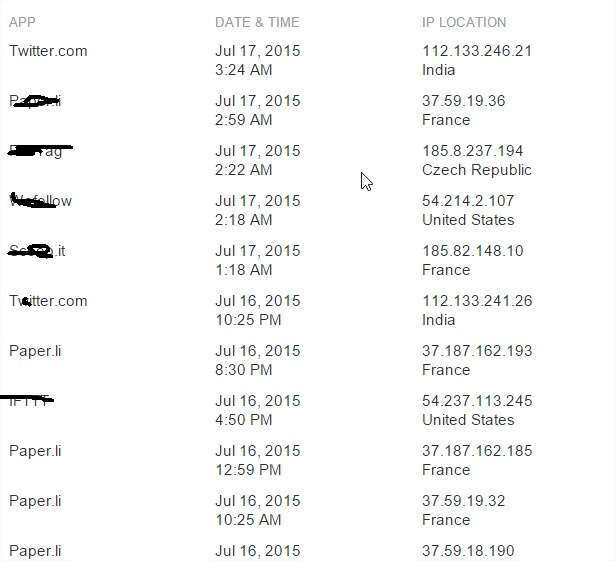 If you see any app which is not authorized to access your data you can report it to Twitter. It will help in keeping your twitter account data safe and private. As shown in screenshot above here you can view manage contacts imported from your address book. You can also download your entire Tweet history. If you want to know which apps are connected to access your account data you can view it via third option. Here it extends your possibilities to know about which accounts you have muted or blocked till now. In twitter login history if you see any login attempt suspicious you can report that immediately or change your passwords to save account from any kind misuse. You can also revoke any app service from using your twitter account data by going Apps. To do so Go Twitter >> Settings >> Apps . Here you will see complete list of apps which are using your account data & having access. With each app you will see option to “revoke access”. You will see details like app name, approval date given by you. Thus new Twitter dashboard is new features to secure privacy & safety. It provides user more control over their own twitter account. Please let me know below in comments if you have any questions, feedback or suggestions.